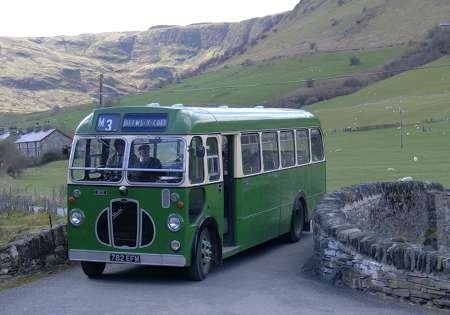 This bus is from the first production sanction of Lodekkas and delivered to Crosville in March 1954. 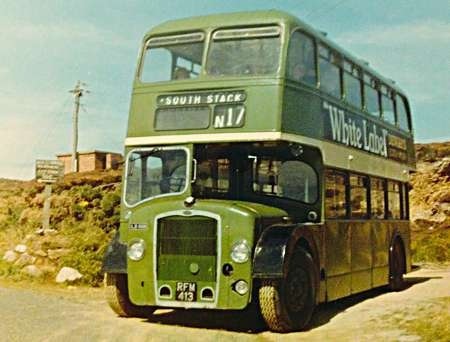 It is seen here in August 1963 at the remote terminus of the service from Holyhead to South Stack Lighthouse. I can’t imagine there has been a bus route there for many years but the bus has a few top deck passengers. I thought the original deep front grille made the Lodekka a very purposeful looking vehicle. The 58 seat layout and lack of entrance doors seemed fairly common amongst early Lodekkas, soon 60 seats and doors were standard. This was one of my earliest bus photos, taken with a Brownie 127 camera and has stood the test of time well. 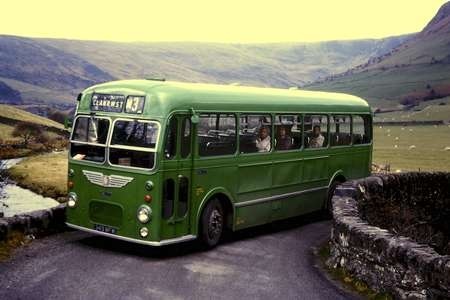 Yes, I can remember going to South Stack on a Lodekka in 1961. It was a useful link for folk staying on holiday at Rhyl, Colwyn Bay, Llandudno etc. and who then bought railway Holiday Runabout Tickets. As I recall, the bus was pretty full in both directions. In those days, before lighthouses were automated, you could have a guided tour – very popular. A lovely picture Ian of a very fine vehicle – and the picture conveys the fascinating "desolate cliff top" atmosphere of the location – you can almost smell the sea air!! 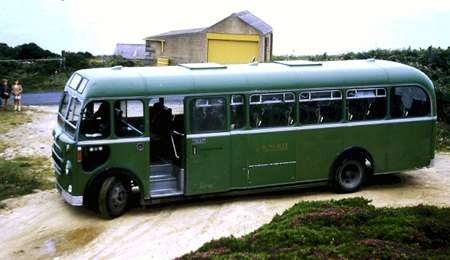 The earliest Lodekkas (we had two such at the Ilkley depot of West Yorkshire) seated only 58 because of the large intrusive castings in the gangway intended to accommodate the twin diffs and prop shafts of the original height saving concept. By the time production commenced this had been amended to one prop shaft and diff only, and therefore the normal longitudinal seats for three could be fitted over the wheel arches, hence the capacity rising to 60. Personally I always preferred the original full depth radiator – the subsequent and later standard shorter one gave the impression that minor accident damage had been neatly repaired by shortening the bottom of the grille !! Now Stephen, what a coincidence! 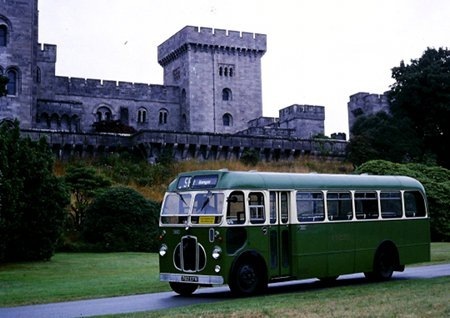 We were on holiday at Llandudno – armed with a weekly rail runabout ticket for the North Wales Coast hence a visit to Holyhead and the trip to South Stack and the bus photo. 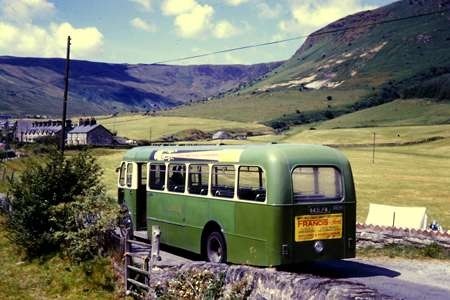 Ian, I suspect Crosville’s South Stack route, and Trearddur Bay for that matter, did rather well out of the holiday runabout tickets. Holyhead was about the longest trip you could take, so everyone did it – but once you got to Holyhead it took about 3 minutes to conclude that the town was a dump! So where can we go from here? Nice to see the photo of the Lodekka at South Stack. As can be seen , the terminus was a piece of waste ground and it was some distance from the lighthouse ,at least a quarter mile walk. Apparently the route was first introduced by the Holyhead Motor Company trading as Mona Maroon and passed to Crosville when said Company was acquired by the LMS Railway in November 1929. The 1932 Crosville timetable showed 5 weekday journeys worked as a loop – with the short double run to the terminus then referred to as Hill Top – via either Llaingoch [ which later became the N17 ] or Porthdarfarch [ which became the N19 ] , the latter involving a narrow twisting lane. 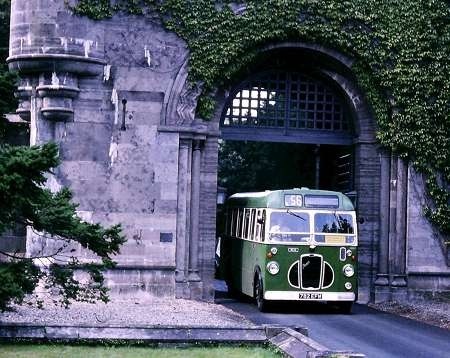 By 1958 just 3 winter weekday journeys [ the morning one just twice a week ] but enhanced in the high summer so that in 1964 there was a choice of 9 journeys for July and August including a Saturday evening return at 9:25pm [21:25 hrs] and a limited Sunday service. However by 1972 there were just 4 weekday journeys which ran only in the high summer and I believe the service ceased entirely soon after , probably from early September 1973. 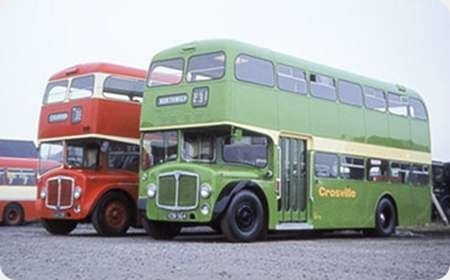 The attached shows the terminus in 1971 when a downgraded Bristol SC4LK coach – CSG class – was more than sufficient for the loadings. It was a nice ride but as I say a little inconvenient for visiting the lighthouse. Lovely 1963 photo. Lovely weather too. Holyhead still is a dump. Have to regularly pass through using the ferries with only the South Stack area worth visiting. The lack of Crosville hasn’t helped. What a very sad and non transport related coincidence in the news. I’m sure that I’m one of many folks who’d never heard of South Stack until this interesting topic appeared here but now the remote location is the centre of an awful murder inquiry following a distressing discovery in a house at Allerton Bywater near Castleford West Yorkshire of a mother and two children in their home – it seems fairly certain that the suspected perpetrator has himself been found dead at South Stack, perhaps the best part of a hundred miles away – very very sad. The CSG photographed at South Stack is very likely to be CSG 637 (198 KFM) which was allocated to Holyhead depot. Holyhead also had SSG 677 (250 SFM). Holyhead needed two Bristol SCs because of the N1 route to Amlwch which was too narrow north of Rhydwyn for anything bigger. Arriva Cymru were still running form Holyhead to South Stack in April 2006 – I had a trip there in an East Lancs-bodied Dennis Dart. What a lovely photograph of the Lodekka. Interesting that it still had its 3-part blind in place.